Tattersalls Ireland graduates produced an amazing display at the inaugural Dublin Racing Festival over the weekend with a Grade 1 double from EDWULF and MONALEE. Derby Sale purchase EDWULF produced a thrilling finish to secure victory in the Grade 1 Irish Gold Cup for JP McManus, Joseph O'Brien and Derek O' Connor. The nine-year-old was purchased by Monbeg Stables (on behalf of Mr D M Forster) from Glenwood Stud for €30,000. In the preceding race MONALEE, trained by Henry de Bromhead jumped superbly to win the Grade 1 Novice Chase. MONALEE was sold at the November National Hunt Sale by Windward House Stud to owner Tom Fitzgerald for €18,000. Tattersalls Ireland graduates recorded a total of eight victories at the Dublin Racing Festival at Leopardstown with additional wins from PATRICKS PARK, an August National Hunt Sale graduate, winning the Grade B Handicap Chase; OFF YOU GO, purchased at the November National Hunt Sale, winning the Grade B Handicap Hurdle; BLACKBOW, a Derby Sale graduate, winning the Grade 2 Bumper; ALLETRIX, another Derby Sale graduate, winning the Grade B Mares Handicap Hurdle; November National Hunt Sale graduate TOTAL RECALL winning the Grade B Handicap Hurdle; and RELEGATE purchased at the Derby Sale, winning the Grade 2 Mares Flat Race. 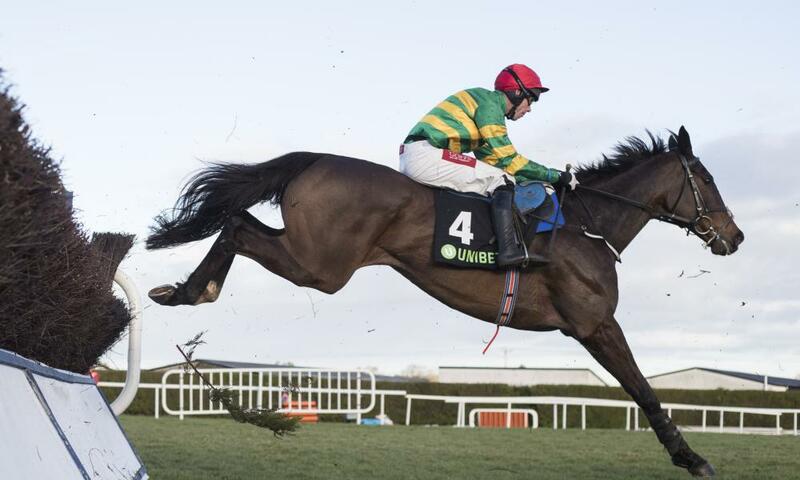 Earlier on Sunday a talented field went to post for the Tattersalls Ireland Grade 1 Spring Juvenile Hurdle, with MR ADJUDICATOR extending his unbeaten record to win for owner David Bobbett & trainer Willie Mullins. Inspections for the May Store Sale and Derby Sale are now underway. Please visit www.tattersalls.ie to nominate.